Cinemetrics is a form of data art that opens up new ways of analysing film. According to cinemetrics pioneer Fredric Brodbeck, this new art form “is about measuring and visualising movie data in order to reveal the characteristics of films and to create a visual fingerprint for them”. Brodbeck produces these digital fingerprints by “disassembling video files into their components [such as] video, audio [and] subtitles”. He then analyses each component for every scene, identifying elements such as average shot length, movement and colour, as well as taking into account a film’s metadata (chapters) while cross-referencing with the IMDb’s source of dialogue from the film. The end result resembles a pie chart, where users are able to look at patterns across the film as whole or inspect further into each segment. Brodbeck creates an interactive and comparative way of exploring cinema that gives its user an insight into the dynamics of any given film. For Brodbeck, cinemetrics enables viewers to assess cinema in its entirety, claiming “nobody has ever seen a movie the way it really is, but always just a partial view […] it’s hard to capture and display them in their entireness” (qtd. in Pavlus). While data analysis may appear objective in the quantification of the cinematic art, Brodbeck’s approach also brings forth subjective aspects of dimension and perception that help users recognise what is typical or distinct across a range of films. Cinemetrics provides a means to step back from a film and reveal what might otherwise remain unnoticed. The more generalised term for Brodbeck’s presentation is data visualisation, which is the process of creating visualised patterns and trends to enable analysis. Data visualisation can help film audiences make more detailed and informed choices based on a film’s colour scheme, level of motion or amount of dialogue. Users can compare a number of films to others they are familiar with. Asking, for example, if the film offers the same pastel colour palette of a Wes Anderson film. As Brodbeck claims, users are able to sort between different types of science fiction films and make more detailed decisions not only based on a film’s genre. For example, 2001: A Space Odyssey (1968) Alien (1979) and Solaris (2002) appear side by side showing how even though the films’ colour schemes remain similarly dark and blue toned, their level of action varies, with the hammering spikes of Alien differing greatly to the slower pulses of Solaris. Cinemetrics can be used to “find out if the data […] inherent in the movie can be used to make something visible that otherwise would remain unnoticed”, the film itself becomes “a source of data” (Brodbeck). The viewer’s choice becomes based more on sense and perception, less intertwined with what is recommended from critics or user reviews on aggregator websites. Data visualisation can also be used to analyse and critique general trends, providing an evidence-based means of uncovering certain industry characteristics. 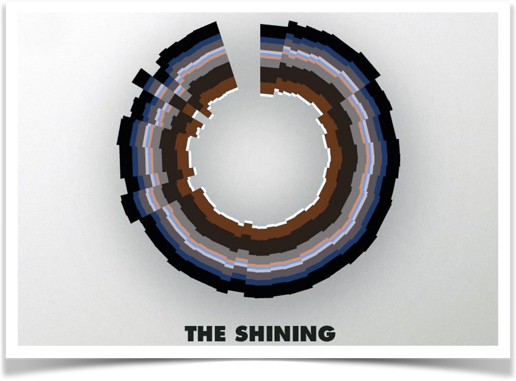 Data-journalist and information designer David McCandless offers scene-by-scene breakdowns of Hollywood films. The infographic Based on a *True* True Story? presents audiences with a “beat-by-beat […] test” of a film’s “veracity on a data level”. As Selma (2015) scores 100% for veracity against American Sniper’s (2015) 56.9% this indicates how data visualisation, for McCandless, “cut[s] through BS and fake news […] reveal[ing] the hidden connections, patterns and stories underneath”. The Hollywood In$ider is an infographic that examines over 1000 major Hollywood films between 2008-2016. The infographic is a traditional scattergraph, but utilises an interactive aspect to encourage users to “filter, sort, plot and delve” into its data (McCandless). The visualisation enables users to find out which films “recouped the most of their budget [and] divided audiences and split the critics”, effectively “star[ing] into the underbelly of the Hollywood machine” (McCandless). The infographic collates data from BoxOfficeMojo, TheNumbers, RottenTomatoes and Metacritic and allows viewers to compare films by their genres, year released and script type, McCandless’ visualisation navigates through a dense amount of information to provide a more functional information map. Hanah Anderson and Matt Daniels produced a visualisation called Film Dialogue from approximately 2,000 screenplays, broken down by gender and age. They explain their project as being “born out of the less-than-stellar response” to their previous infographic Hollywood’s Gender Divide and its Effect on Films which analysed films that failed the Bechdel Test. They sorted the 200 highest grossing films between 1995-2015 into three categories: films with an all-male writing team, films with at least one woman writer and films with all women writers. Then they looked at how many passed and failed the Bechdel Test in each category. The results of Gender Divide showed that by having even one woman on the writing team improved the odds of passing the Bechdel Test. The team behind the visualisation believed it revealed the problem surrounding Hollywood’s diversity problem, claiming the issue lies in not what is on the screen but also behind it. They speculated that “filmmakers, unintentionally, make movies about themselves” and “since the most powerful producers, writers, and directors are men, male-themes permeate into Hollywood’s output” (Blinderman). Although their infographics do not take account of dialogue as it appears in the completed film (including screen time or the context of how a character is portrayed) Anderson and Daniels argue “we have to assume that screenplays, across a large sample, are more or less representative of the final product” and “by measuring dialogue, we have much more objective view of gender in film”. Their visualisation aims to evidence statements about the industry’s lack of diversity and this is especially significant in relation to recent campaigns such as #OscarsSoWhite. Data visualisation can also be of interest to the film industry. It can be used throughout the process of filmmaking, from pre- to post-production, as well as after a film’s release. Former Lucasfilm Chief Technology Officer, Dave Story, while discussing Hollywood’s previous approach to big data, observes that “entertainment companies have always had data – the trouble is that much of it has been backwards-looking”, relying too much on previous trends (Cox). In contrast, data visualisation now enables the industry to make more informed and cost-effective choices in relation to the films they are yet to produce. Story notes how films such as The Avengers (2012), Gravity (2013) and Captain America 2: The Winter Soldier (2014) all utilised pre-visualisation of “complex scenes and effects” (Cox). The Avengers used pre-visualisation for location logistics, including “plotting out a virtual clock to determine best times of day to shoot” (Sarto), as well as for technical measurements such as props, stunts and CG performances. Story also states that companies are now “doing visualisations of their data”, working out “the costs and data flows for all the pixels […] put on [a film’s] movie screen” (Cox). Brodbeck formulates, what he terms, “movie barcodes” after a film has been created. Yet, by producing these barcodes before films are made, companies are able to use graphics and visualisation to already for logistical planning of the production of large amounts of data. According to User Experience designer Jeff Soyk, who was also part of the Peabody-winning, web-based documentary Hollow (2013), “[data visualisation] can not only act as supporting content but can drive the overall story” (Astle). Hollow focuses on the lives of residents in the small town of McDowell County, West Virginia. The film, as an interactive documentary and community participatory project, utilised transmedia storytelling to reflect the varying stories of the county’s residents. Data visualisation drove parts of Hollow as users were able to manipulate the graphics and navigate through stories of unemployment, drug use or health issues. While working with data visualisation for Hollow, Soyk states “the challenge in generating these graphics is contextualising them, designing them and making sure they play an appropriate role in propelling the story forward” (Astle). As such, data visualisation becomes integral in the film itself, not only aiding with industry pre-visualisation, but also in pre-conceiving a cinematic universe. Brodbeck’s own barcodes and fingerprints becoming stories within themselves. In contrast to this optimistic view, Johanna Drucker asserts that “every single visualisation being used in the digital humanities is visually impoverished, conceptually corrupted and intellectually inadequate to the tasks of humanistic work” as they rarely exhibit the true extent of ambiguity, heterogeneity and contradiction within film data (Drucker 2016A). Drucker argues that “there are no transparent visualisations […] they are all acts of interpretation with assumptions that are encoded in their form”, therefore, “we need to pay attention to and engage with [the] distortions” of data visualisation (Drucker 2016B). For Drucker, the question remains, can critics and scholars in the humanities adopt visualisation methods from other disciplines and the industry and use these to make full, meaningful interpretations of a particular film? It is not enough to accept data as it is in a graph or diagram, there is a need to question who made it and why, as well as ask which value system it is based on. Like Drucker, Papagena Robbins believes information is never simply information because it is also shaped by ideology. In response to theorist Marc Furstenau’s uncertainty of the value of data visualisation at the 2011 Impact International Conference, Robbins asserted that film-making should not subject to the imposition of quantitative methods. Robbins is wary of the use of such “quantification projects” to “create the ‘perfect film formula’ […] which can be used in a totalising manner by business executives to limit which scripts get produced and which do not in the future”. Data visualisations, for Robbins, must be always be scrutinised as much as the film itself. Matthew Ogonoski also has reservations and asks, “is it worth constructing the graph only to find what one was looking for […] why would one bother spending the time to compile a graph simply to start with the graph as the object of study?”. Ogonoski queries the value of such research and its “ludicrously frivolous findings”, viewing cinemetrics as rhetorical and adding little to the discipline of film studies. In order to explore cinema, he argues, it is “infinitely more satisfying” to begin with the film itself. Perhaps data visualisation has yet to rise to Drucker’s challenge as the question of how to represent. Cinemetrics, however, does provide us with innovative ways of analysing film that are useful to audiences, critics and filmmakers. Rather than focus on the difference between box office gross or the critical reviews of Andrei Tarkovskii’s Solaryis (1972) and Steven Soderbergh’s Solaris (2002), Brodbeck’s approach uses “the movie itself as a source of data”, looking at “what sort of information can be extracted from it” and creating a more dynamic and interactive graphic representation of these two films side by side. The result is illuminating and provocative, even if we don’t yet know quite what to do with the what is revealed. Anderson, Hanah and Daniels, Matt. “Film Dialogue” pudding.cool, n.d. Web. 9 Mar. 2017. Astle, Randy. 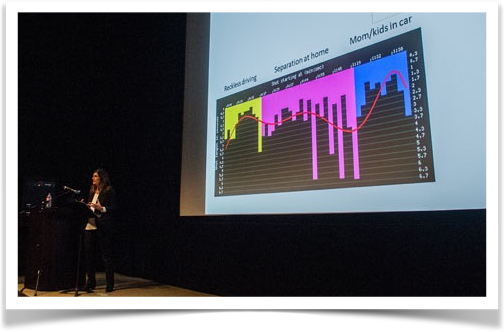 “Charting the Course: Data Visualization in Documentary Film”. Filmmakermagazine.com, 20 Oct. 2014. Web. 9 Mar. 2017. Blinderman, Ilia, Daniels, Matt and Friedman, Lyle. “Hollywood’s Gender Divide and its Effect on Films” polygraph.cool, n.d. Web. 9 Mar. 2017. Cox, Ryan. “How Hollywood is Reshaping Big Data visualisation”. Siliconangle.com, 6 May 2014. Web. 9 Mar. 2017. Drucker, Johanna. “Graphic Provocations: What Do Digital Humanists Want From Visualization?” Sir David Davies Lecture Theatre, London. 25 May 2016. Lecture. Drucker, Johanna. “New Dimensions in Humanities Visualization” University of Hamburg, Hamburg. 6 Jun. 2016. Lecture. McCandless, David. “Based on a *True* True Story?”. Informationisbeautiful.net, n.d. Web. 9 Mar. 2017. McCandless, David. “The Hollywood In$ider”. Informationisbeautiful.net, n.d. Web. 9 Mar. 2017. Ogonoski, Matthew. “Furstenau and the problem of Cinemetrics”. Arthemis-cinema.ca, n.d. Web. 9 Mar. 2017. Robbins, Papagena. “Polemics and Disciplinary Questioning in Marc Furstenau’s Talk on (the style of) ‘Cinemetrics’”. Arthemis-cinema.ca, n.d. Web. 9 Mar. 2017. Sarto, Dan. “The Third Floor Helps Visualize ‘Avengers: Age of Ultron’”. Awn.com, 10 Jun. 2015. Web. 9 Mar. 2017.